With less than a minute left in the third period against Hill-Murray, BSM goalie Jalen Long lowered his head. The Pioneers just scored their seventh goal of the game and the rowdy student section at Aldrich Arena is not cutting the junior any slack. An audible “sieve” chant starts up by a front-row student and soon dozens of kids dressed in green and black are pointing at Long. With no mercy, even some BSM fans make side comments. “Play well, they chant for you, play bad, they make up songs about you and continue to repeat them…over and over,” Long said. They don’t understand what it’s like to be a goalie. They can’t comprehend the pressure put forth upon these kids who wear big pads and silly helmets. Yeah, he let in seven goals, but after all, he’s only human. This scene is all too familiar at hockey games of every level, as it’s easy to blame the goalie for a loss. Just walk BSM’s halls any day after a hockey team loss, and there will surely be chatter of how much we need former goalie Justin Quale or what went wrong in the goaltending department that night. “The pressure can be stressful, and losing is worse. Being on stage every night can be amazing in both positive and negative ways,” Long said. So with all this pressure, it’s hard to comprehend why anyone would ever want to step into that blue paint and take shots speeding at the rate of cars down a highway. “It’s arguably the highest pressure position in sports, and I love that the game is constantly on your shoulders. 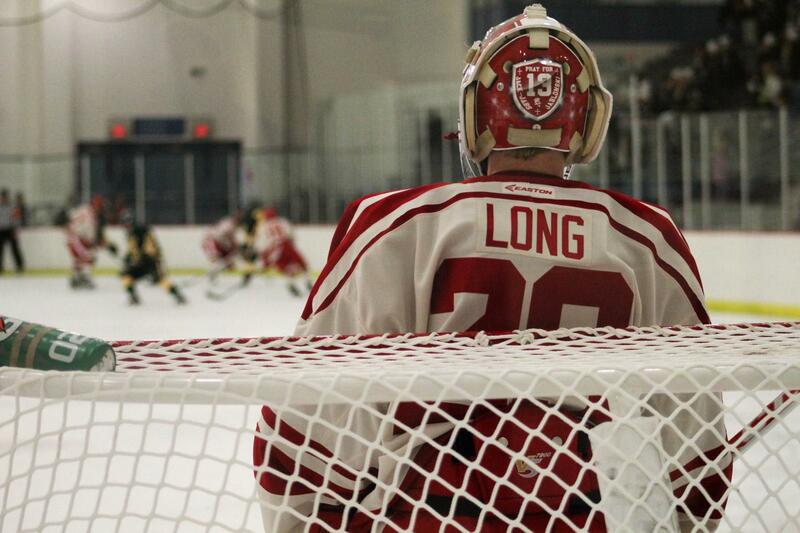 Even though it may not go well every night, the challenge is what brings me to the rink every day,” Long said. Pressure is part of the job description, though. It’s no secret that the weight of any game lies on the goalie’s shoulders, and what separates the good goalies from the great ones is their ability to handle this pressure and thrive in the spotlight. “I concentrate on what I can control, not the things I can’t. I do that by focusing on the first shot, then the next five, and giving my team a chance to win,” Long said. But playing time is not something that’s always in the goaltender’s control. At a hockey powerhouse like Benilde-St. Margaret’s, there is always competition, and this includes between the goalies for playing time. With two, possibly even three guys, fighting for a starting position, there is a special bond that forms between these players. Along with Long, junior Matt Knuth and freshman Ryan Bischell have both logged time in net for the varsity team this winter. This creates a competitive, yet supportive atmosphere in practice for all three goaltenders. “We need to push each other and drive the level of competition up each and every practice. We support each other when things go well, but more importantly support each other when things go poorly. It’s easy to win together, but learning to support in tough times is far more important,” Long said. 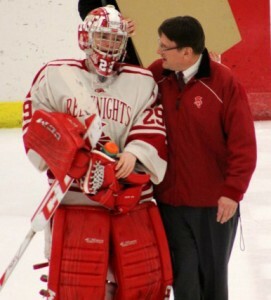 Former Red Knight goaltender and state champion Justin Quale found the same thing to be true when he played at BSM. “The biggest thing for me was learning how to compete for playing time. Playing youth hockey at Hopkins, I usually was the only goalie on the team so I would get to start all the games, but at BSM I had to earn it,” Quale said.